The international demand for fine Australian wine continued to grow in 2018, with both value and volume increasing over the course of the year. 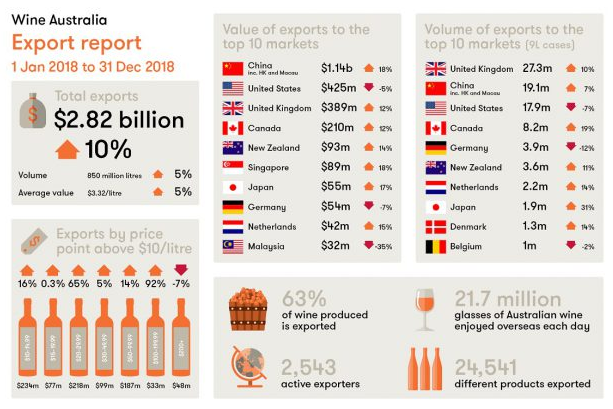 “These figures demonstrate strong international demand and they highlight how Australian wine exporters have worked diligently to develop and maintain international markets,” said Andreas Clark, CEO Wine Australia. The average value of bottled wine saw 10 per cent growth to a record $6.20 per litre FOB, after the value of bottled wine shipments increased by seven per cent to $2.24bn, while volume decreased by three per cent to 361 million litres. Another record was the value of exports above $10 per litre, which grew by 22 per cent to $895m. The value of exports above $10 per litre FOB now surpasses the value of exports in the $2.50–4.99 per litre segment, which is historically the largest segment of exports. Unpackaged wine also saw strong growth, with a 27 per cent increase bringing a record high of $560m. Volumes of unpackaged wine also increased, up 12 per cent to 480 million litres or 53 million nine-litre case equivalents. Red wine continues to be the most popular wine style exported from Australia, and value increased by 12 per cent to $2.14bn in the year ended December 2018. The value of white wine exports also grew – by 10 per cent to $607m. There was growth in Australian exports to nearly every region of the world in 2018, with exports to North America starting to level out after being in decline for more than 12 months. the Middle East grew by 36 per cent to $33m.